Have you ever been praying to your favorite patron saints and gotten the funny feeling that they ain't listening? Well, you'll be thrilled to know that there are some lesser-known saints to whom you might want to redirect your devotion! These not-so pious patrons for the 21st century are here to represent all your deepest transgressions in one hilarious volume. 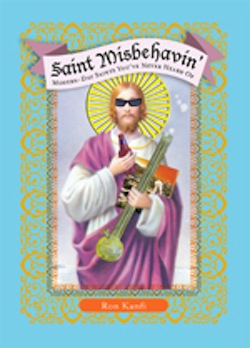 Accompanied by character profiles and biological facts that will have you rolling on the floor laughing, Saint Misbehavin': Modern- Day Saints You've Never Heard Of is the answer to all your prayers.